We sell industrial machines including low-cost CNC Plasma cutting machines. There are many types of plasma cnc machines that we sell at low prices. 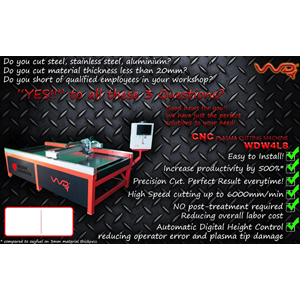 To get a cnc plasma cutting machine at a low price, you can get it through the product catalog below or can contact us through our contacts. Industrial Grade CNC plasma cutting. Production speeds up to 6 m/min. Reduce production time up to 80% compared to manual cutting. The size of the Table can be adjusted with the request.